Need blueberry recipes for handy healthy recipes for kids? Here's healthy blueberry recipes for drinks, salads, sauces, main dishes, and healthy snack recipes for kids. Don’t forget parents and grandparents – blueberries are BEST for stroke recovery and treatment – a surprise finding by scientists! Blueberries help with better learning, heart health, vision, memory AND with weight control, so get kids started early! Eat frozen blueberries right out of the freezer. Munch on blueberries while still frozen – straight from the package -- you can buy fresh blueberries in season, and put them straight into the freezer for snacking or for blueberry recipes. Freeze on a cookie sheet first so they don't stick together and then put into a freezer bag. 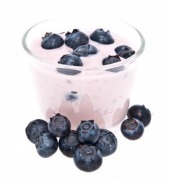 Add blueberries to yogurt or to SMOOTHIE or try making a blueberry lemonade. Add frozen or dried blueberries to cereals for breakfast, and then add ground flax for a fast breakfast or snack for young and old. YUMMY and super healthy! Grind flax seeds as needed in coffee grinder for freshness. Have a bowl, or bag of dried blueberries mixed with roasted sunflower seeds or nuts for healthy eating for toddlers and kids. Add blueberries not only to desserts but to main dishes, poultry as well as sauces, salsas and vinegar. Make a habit of using blueberries in healthy recipes for kids -- young and old. Why? “We now know that blueberries are one of the best sources of antioxidants, substances that can slow the aging process and reduce cell damage that can lead to cancer,” according to the American Institute for Cancer Research. In the Wall Street Journal (4/29/03), an article on reversing memory loss noted “blueberries . . . had the strongest impact” in a study showing aging rodents behaved more like their younger counterparts when fed several different fruits. Why blueberries in healthy snack recipes for kids and adults? Eating lots of blueberries help with learning and memory! feeding blueberries to laboratory rats SLOWED age-related LOSS in their MENTAL CAPACITY, a finding that has important implications for humans. In one study, Jim Joseph, director of the neuroscience laboratory in the USDA Human Nutrition Research Center (HNRC), fed blueberry extractions—the equivalent of a human eating one cup of blueberries a day—to mice and then ran them through a series of MOTOR SKILLS tests. He found that the blueberry-fed mice PERFORMED BETTER than their control group counterparts in motor behavioral LEARNING AND MEMORY, and he noticed an increase in exploratory behavior. When he examined their brains, he found a marked decrease in oxidative stress in two regions of the brain and BETTER RETENTION of signal-transmitting neurons compared with the control mice. So best to have blueberry recipes or a bag of frozen blueberries handy for when kids get hungry. Blueberry Recipes for what causes a STROKE & Treatments! Better stroke recovery with blueberries? 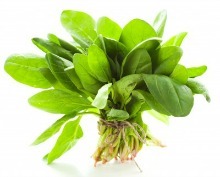 Yes, Spinach and Blueberries Surprise Scientists for Better Stroke Recovery! •	A study published in the journal Experimental Neurology suggests that antioxidant-rich fruits and vegetables can limit brain damage from stroke and other neurological disorders. USF/VA neuroscientist Paula Bickford, PhD, and colleagues, found that rats fed diets preventatively enriched with blueberries, spinach or an algae known as spirulina (a phytoplankton) experienced less brain cell loss as well as improved recovery of movement, following a stroke. Previous studies had already shown that adding blueberries, spinach or spirulina to the diet, reversed normal age-related declines in memory and learning in old rats. Researchers were amazed at the extent of neuro protection that antioxidant-rich diets provide. So we can teach young and old to be "smart rats" with healthy recipes for kids and older folks! More blueberry recipes for what causes a stroke! Dr. Bickford, a researcher at the USF Center for Aging and Brain Repair found that when they added blueberries, spinach and spirulina to the diet of rats, and induced a stroke, the size of the stroke was 50 to 75 percent less!. Scientists think that that the antioxidants and anti-inflammatory action in blueberries and spinach reduces the nerve cell injury and death triggered by a stroke. They recommend ongoing stroke treatments with blueberry, spinach, or spirulina to decrease cell death (ischemia/reperfusion-induced apoptosis) and cell death due to stroke. (cerebral infarction). This is an easy, readily available and safe way improve STROKE REHAB! BEST STROKE TREATMENTS will also include taking a multiple vitamin with folate and vitamin B, which has been shown to benefit heart health. Blueberries, along with other colorful fruits and vegetables, test high in their ability to subdue free radicals and are the perfect food for for both kids and for anti aging. The free radicals, which can damage cell membranes and DNA through a process known as oxidative stress, are blamed for many of the dysfunctions and diseases associated with aging. So, remember that people who ate a cup of blueberries a day, performed 5–6% better on MOTOR SKILLS tests than the control group. We hope that you will add healthy blueberry recipes to your family eating. Healthy recipes for kids will set them up for a lifetime of better learning and memory. And for their parents and grandparents, will protect against what causes a stroke.